The purpose of the WYC is to create programs and services that supports the student body of Westport and builds community. 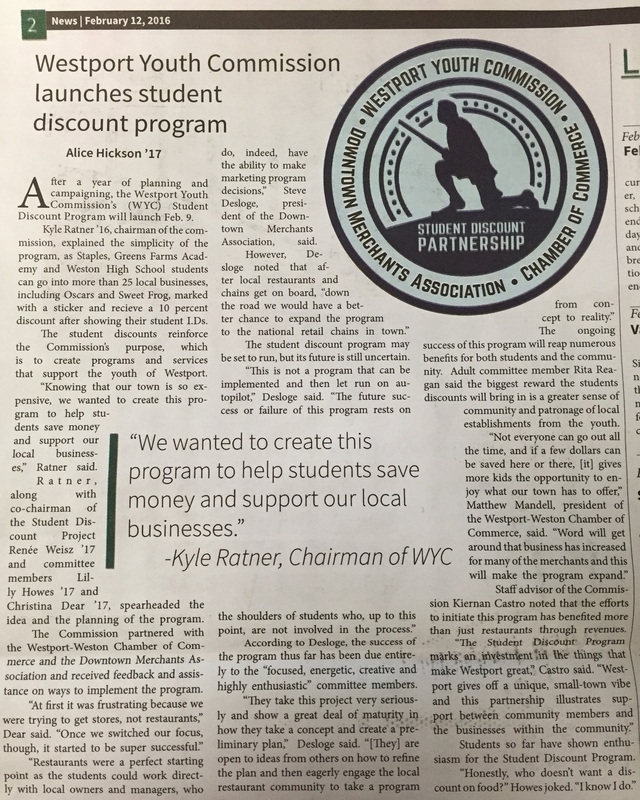 In collaboration with the Westport-Weston Chamber of Commerce and the Downtown Merchants Association we created this program to help students save money and support our local businesses. The student discount is offered for Staples High School, Greens Farms Academy, and Weston High School students when the locations are open for business. In order to use the discount a student must present their student I.D. during the time of purchase. It is not offered for delivery service. All location are in Westport or Weston (even if it is a chain). This list is always subject to change. Participating locations will have the student discount sticker (generously donated by Baker Graphics) displayed in their window.